Home Decorators Collection LED outdoor wall lanterns use 70% less electricity than traditional incandescent fixtures, and there is no bulb to replace or recycle. The LED light source is the most reliable outdoor lighting available because it turns on instantly in any temperature, and lasts 50,000 hours without replacement. These fixtures are built with cast aluminum and steel to look great for years to come. They are easy to install and are suitable for use in wet locations. This 5 in. 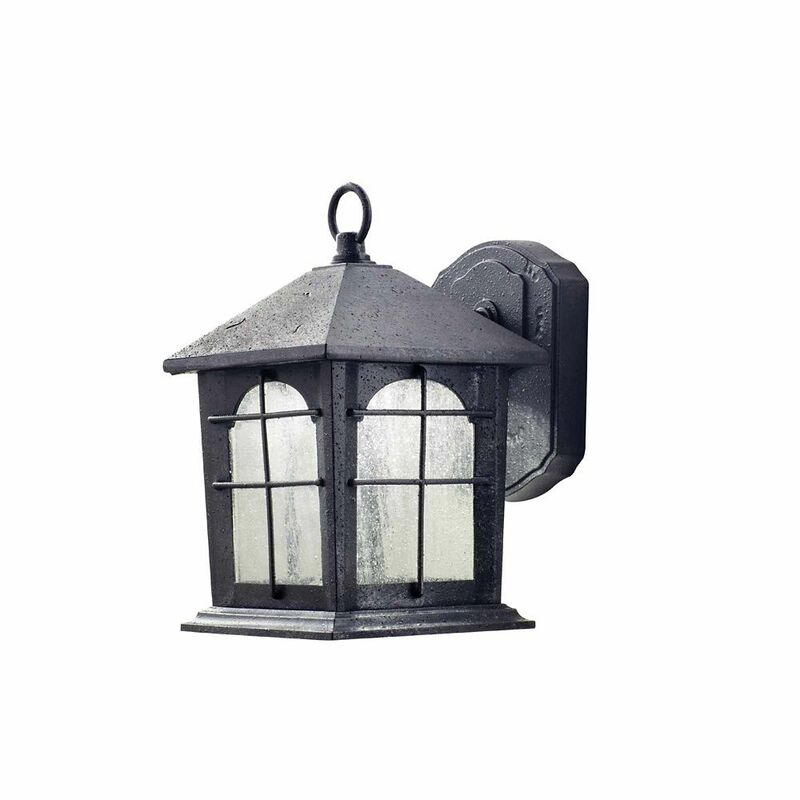 wall lantern features an aged iron finish and clear seedy glass with a simple, elegant design that compliments any exterior decor. This Home Decorators Collection Exterior LED Small Wall Fixture features a glass in glass design and produces 239 Lumens from only 5W of electrical power. The fixture mounts to any existing, standard 4 inch electrical box. The LEDs are powered by a Class II Low-Voltage LED driver. Durable and all-weather resistant construction. 9-Inch 1-Light Aged Iron Integrated LED Outdoor Wall Lantern - ENERGY STAR® Home Decorators Collection LED outdoor wall lanterns use 70% less electricity than traditional incandescent fixtures, and there is no bulb to replace or recycle. The LED light source is the most reliable outdoor lighting available because it turns on instantly in any temperature, and lasts 50,000 hours without replacement. These fixtures are built with cast aluminum and steel to look great for years to come. They are easy to install and are suitable for use in wet locations. This 5 in. wall lantern features an aged iron finish and clear seedy glass with a simple, elegant design that compliments any exterior decor. 9-Inch 1-Light Aged Iron Integrated LED Outdoor Wall Lantern - ENERGY STAR® is rated 4.2 out of 5 by 6. Rated 4 out of 5 by AJ from I don't care for the sensor operation. May be due to electrician wiring. I will re-wire for sim... I don't care for the sensor operation. May be due to electrician wiring. I will re-wire for simple on/off operation. Rated 1 out of 5 by MDG from Well I liked these at first but I just had one go out after 6 months of use. There is no way it ... Well I liked these at first but I just had one go out after 6 months of use. There is no way it has reached the minimum of useful hours. Now I have to take it down and find a replacement. Rated 5 out of 5 by red from There will never be a need for a bulb since it is an LED light. The design is attractive too. There will never be a need for a bulb since it is an LED light. The design is attractive too. Rated 5 out of 5 by goodreason from Bright Enough The light fixture is made of all metal, LCD Energy Star Certified, 3 year warranty, fully enclosed on all sides with the bottom open. The LCD consists of a circuit board with multiple emitters instead of one bulb, making this a disposable light. After just remodeling our deck it was now time to change the outdoor light, which after all was 20 years old and it looked it. After some research, we decided on an LCD light because not only does it save money, the light is on all night via a timer, it also helps the environment. Easy installation, all the hardware is included, and easy to read instructions. It's been installed for 2 months without any problems. This review sounds hypocritical because on one hand it saves energy, but on the other hand it satiates our landfills even more, once it stops working. You could look at that way but, the metal, glass, and even the circuit board can be recycled, if you just take the time to do it. The camera was set at a 5 sec. exposure with an ISO of 400 for the 2 pictures of the deck at night.